One thing for sure is that there are more and more non-dairy alternatives hitting the shelves! But should you be worried about coconut’s saturated fat? Then in short, no. One single dietary component is not going to be the “poison” or be a lethal “killer”. In fact, saturated fat has been made out to be something it’s not. Its had a bad wrap for years and now new research has uncovered the reality, and it’s good news for coconut lovers! You can read more on that here and here. Most of you know about Coyo, but have you heard of No Udder or Alpine from NuLac Foods? I recently sampled both brands to see whether or not it was worth your effort. 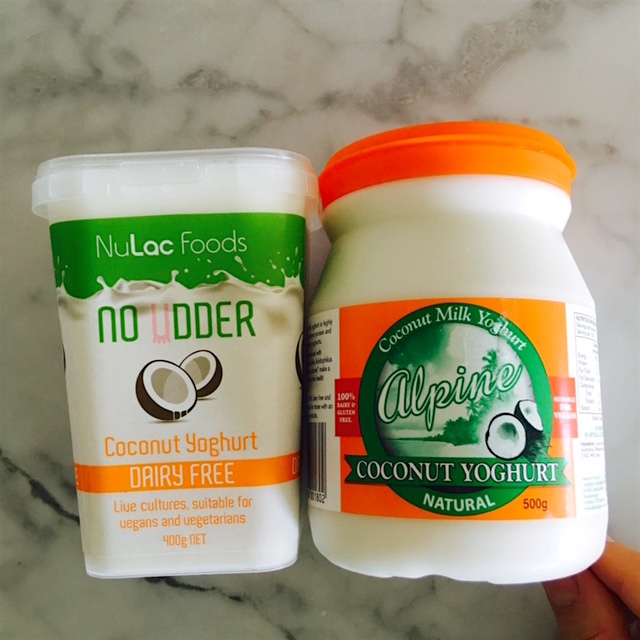 First up, let me tell you…..Last year I tried the Alpine Coconut Yoghurt and it wasn’t good. Coyo was smothering the non-dairy scene but I was looking for other options as I find Coyo quite sweet and heavy in my stomach. So I was anticipating that buying it again this year would be a waste. But I was wrong. These guys have brought their A game and the yoghurt is actually delicious this time! No Udder has both a plain Coconut Yoghurt and an Almond Milk Yoghurt. Alpine sticks to just the Coconut Yoghurt for it’s non-dairy option. They’re plain. They have a base amount of sugar but they’re not laden with sugary extras like berry sauces etc. They’re not as sweet as Coyo and don’t have that “sweet” stevia aftertaste as they’re stevia free. They’re thick and creamy. Yep, almost like double cream with a very slightly whipped texture. It’s good! They’re gluten and dairy free. Suitable for vegans and contain NO added preservatives, colours or flavours. The sugar content is a little high for No Udder. No Udder Coconut sits at 7g/100g serve, No Udder Almond sits at 5.3g/100g serve, but Alpine Coconut sits at 4.2g/100g which is pretty good. No Udder Almond Milk also contains inulin. Coconut yoghurt: coconut extract, water modified corn starch, sugar, live cultures. Almond milk yoghurt: almonds, water, oil, modified starch, pectin, inulin, sugar, live cultures. Whilst I’d prefer no sugar yoghurt if I was to create my ultimate non-dairy version, I’d much rather a little natural cane sugar to sweeten than sorbitol, aspartame, maltitol, or stevia (this one mainly for the aftertaste I don’t like). And all three of these use regular sugar so those with sensitive stomachs would be able to tolerate this one a little better compared to those sweetened with alcohol sugars and artificial sweeteners. All three contain modified starch for use as a stabiliser. This helps to hold it all together, thicken and stabilise which makes the texture really good. But it’s an ingredient I wouldn’t use if I was making it at home. Both coconut varieties are super coconutty. Not too sweet and no artificial aftertaste which makes them great for pairing with my favourite treat, frozen berries! It’s quite addictive for me and the coconut varieties are definitely my choice out of the three. You can find No Udder at Coles, and Alpine at Woolworths. They’re around $6-$7.50 each for 400g. Are you crazy for all things coconut like me too? 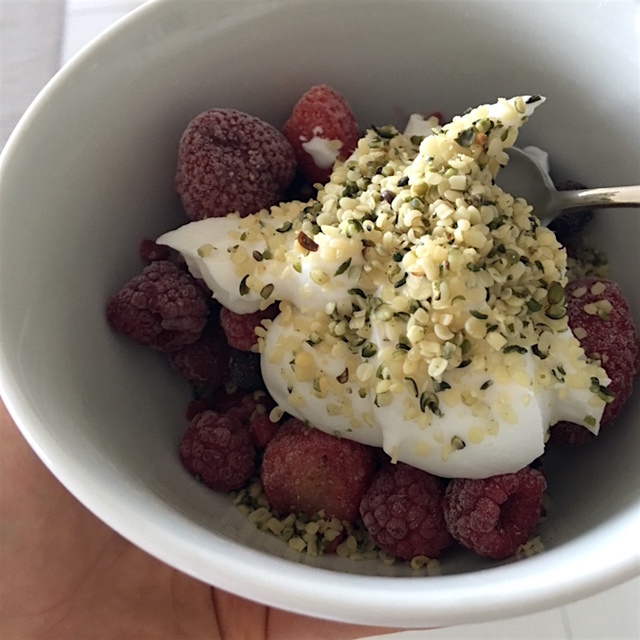 How do you use coconut yoghurt?